A healthier version of ever-popular chicken nuggets, these are coated in calcium-rich sesame seeds and then baked in the oven until crisp and golden. 1. Mix together the soy sauce, honey and sesame oil in a large, shallow dish. Add the chicken and turn to coat in the marinade, then cover and leave to marinate in the refrigerator for at least 30 minutes. 2. Lightly oil 2 large baking trays. Put the sesame seeds on a large plate and roll each chicken fillet in the sesame seeds until evenly coated, then transfer to the prepared baking trays. 3. Place in a preheated oven, 180°C (350°F), gas mark 4, for 20 minutes, turning once, until the chicken is cooked through and the seeds are golden. 4. Meanwhile, mix together all the chilli-mayo dip ingredients in a bowl. 5. 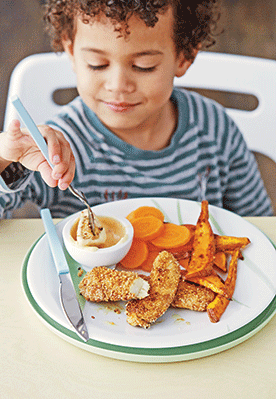 Serve the chicken nuggets with the chilli-mayo dip and accompanied by roasted sweet potato chips and sliced steamed carrots, if liked.